About 30 years ago, the original Admiral's Cup watches became the new watch trend, which set by the company Corum, inspired by sailing. The latest novelty in the Legend series - the Admiral's Cup Legend 42 Annual Calendar watch, is presented at the annual international exhibition BaselWorld 2012. As noted by the creators of this model – the Swiss watch Admiral's Cup Legend 42 Annual Calendar - tributes honor of classic watchmaking and a striking example of the elegant aesthetics. The Admiral's Cup Legend 42 Annual Calendar watch carries the DNA of its famous predecessor, repeating all the key elements in its design: a 12-sided bezel and 12 nautical flags of the 12 figures in the international code of naval signals. First of all, the development of Admiral's Cup Legend 42 Annual Calendar model designers sought to create a bright, recognizable at a glance accessory. The result has become the duet of red gold and steel with silver or anthracite dial. In addition to display hours and minutes, the watch is equipped with a special lace hand, indexing the date on the circumference of the dial. A month is indexed in a special window with a spiral pattern at the 6 o’clock position. However, the main advantage of the watch is an annual calendar, which is certainly one of the most exciting and challenging watch functions. So, the Admiral's Cup Legend 42 Annual Calendar watch is equipped by an annual calendar function that automatically takes into account the varying length of months and needs to be adjusted only once a year at the end of February. Current time is indexed by partially skeletonized three hands, coated with white fluorescent substance that makes them perfectly legible even in complete darkness. Elegant design is completed by the date hand with counterweight in the form of emblematic key Corum. Hour indexes of the watch are applied, at the 12 o’clock position is the number "60". The version of steel is decorated with vertical guilloche. The version of the red gold is decorated with finishing in the style of "a grain of barley." The company has introduced the model in a limited edition of 175 items, so admirers of Corum chic should hurry to buy a watch. The Admiral's Cup Legend 42 Annual Calendar watch operates on the basis of an automatic mechanism Corum CO503, with a power reserve of 42 hours. The back side - sapphire, overlooks the work of the mechanism and the inertial sector, decorated with brand’s logo. The watch case in diameter of 42 mm is water resistant up to 30 meters. The watch strap is from leather with a folding clasp in stainless steel version and the version of gold with a spin. The Admiral's Cup Legend 42 Annual Calendar watch is presented in a limited series: 25 instances of red gold, and 150 instances of the steel. 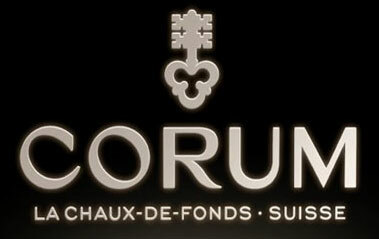 Official website of Corum watches.